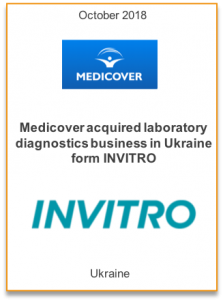 18 October 2018 – Medicover (MCOVB:SS) has signed an agreement to acquire the Ukrainian laboratory operations of INVITRO. The operations consist of a total of 61 blood drawing points (BDP’s) and one laboratory, focused on eastern and central Ukraine. The business is expected to be consolidated in the beginning of 2019. The transaction is subject to customary regulatory approvals. Baltic Partners supported Medicover in all stages of transaction, including idea origination, non-binding offer preparation, valuation and synergies analysis, deal structuring, due diligence, negotiations of transaction documentations and communication with stakeholders. Medicover (MCOVB:SS) is a leading international healthcare and diagnostic services company with main operations in Poland, Germany, Romania, Ukraine and certain other markets in Western Europe, Central and Eastern Europe and other emerging markets. For 2017, Medicover generated revenue of €580.2 million and adjusted EBITDA of €56.2 million. End of September 2018, Medicover had a total of 229 BDP’s in Ukraine and will through the acquisition increase distribution reach in Ukraine. Synergies will be achieved through combining the laboratory facilities and other support functions. The purchase price amount to EUR 6 million, implying a low single digit EBITDA multiple after full impact of synergies. “The acquisition of INVITRO’s Ukrainian operations extends our geographical coverage for customers and also shows our long-term commitment to providing the Ukrainian population with health services.”, says Fredrik Rågmark, CEO Medicover. INVITRO is the leading private medical company in Russia, which is specializing on providing laboratory diagnostics services. INVITRO operates a network of over 1000 medical offices and 8 laboratories in 5 countries: Russia, Belarus, Kazakhstan, Armenia and Kyrgyzstan. In 2016 aggregate revenue amounted to 12.6 bln roubles. The transaction was led by Baltic Partners team, including Dmitry Smirnov (Partner) and Volodymyr Tylnyi (Senior Associate).